Family Affairs has released their latest collection, Les Vecances, for spring/summer 2012 and as usual, there are plenty of things that have caught my eye. With March in full force, I'm really ready for the days when I can wear simple dresses and sandals and not think about layers and sweaters and how I'm going to keep my legs warm. 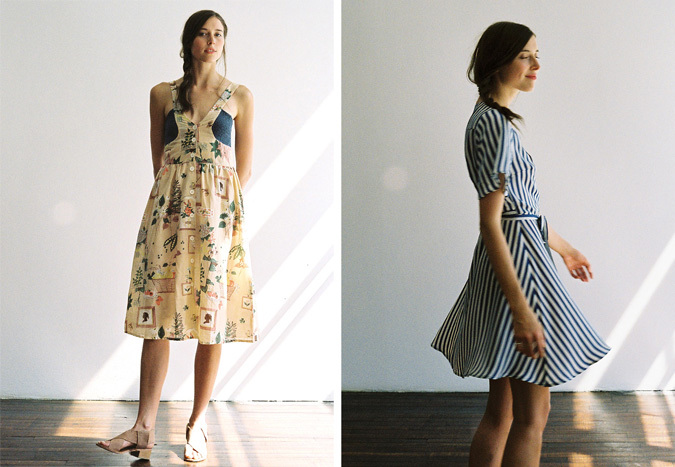 There are some really lovely vintage inspired silhouettes in this collection and I'm always a fan of nautical stripes. I'm happy to say that the striped wrap dress is all packed up and on its way to me all the way from Switzerland. I feel like its going to be my go-to dress this summer. Ohhh, so much cuteness!!! Off to check out their pieces more closely! wow, really love all of these pieces! Gorgeous collection, I'm loving the cute top with the peter pan collar!